My wife and I decided to get new carpet in the home that we recently moved in to. We called empire for an estimate and scheduled an appointment for 3-5 pm. They never showed so we called them to see what's going on. They said they are running behind and they could be there around 9pm. I just canceled because I had to work in the morning. Months later we decide to try again. This time the salesman was on time. He took what seemed to be very fast and inacurate measurements and did not even write all of them down. When we sat down to discuss pricing, he said we have 1700 sq feet and that it would cost $6000. He then said let me make a phone call and get the price lowered for you. After his phone call he quoted us $4400. For the mid grade carpet. He also tried to talk us out of getting the premium grade carpet. We decided to get a second opinion from home depot. I told home depot what empire quoted me and they said that I should do my own measuring. I measured and came up with 1250 sq ft!! That's a 450 sq ft difference. After calculating in a Premium carpet, padding and install, home depot came out about the same price. Home depot will also be sending out a company that specializes in measuring and they assured me they will take very accurate measurements. Also, when I asked the Empire salesmen how many sq feet our staircase was he could not give me a staight answer. He said that you can't measure stairs in sq ft. When I asked home depot about this, she said that thats not true and she would not lie to me because she does not get commission. The Empire salemen also had a strong odor of alcohol that both me and my wife noticed. Review #142318 is a subjective opinion of MikeB. I wish I would have read these comments before buying from Empire. We only needed our bedroom done. It was measured by Empire at 30 square feet and we were quoted a price of 1100.00!...we too got the let me make a phone call deal...he came back with 900.00. Well, our carpet was installed yesterday and we had enough left over to do half the room again. My husband's measurements are 23 sq feet. We paid for 200.00 worth of carpeting that we don't need. I called them today with my complaint. Sounds like you are a glutten for punishment. 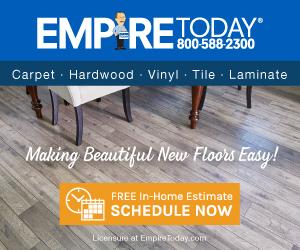 Why don't you go to an independent flooring specialist and get the job done right. Home Depot is great for nails and hardware but not for professionally installed projects. You can find as many complaints against Home Depot as you find on Empire. I had a similar experience with over measuring with a differnt carpet company. While they were installing I had to go out to check if my carpet was getting wet since the roll was hanging out the back of their van. I noticed a tag on the carpet, its measurement, and our name on it. I found out that they brought less amount of carpet, but was not going to tell me. We had thought their measurements were too much and we were right. We were refunded almost $700. Electronic measuring device said my room was 25.6 by 14.5 when it is 21.6 by 11.6. Made the consultant use regular tape measure and I was right. Also got the "let me make a phone call" routine and thought price was a little steep, but liked the vinyl he had so we are going to have them install. Consultant was not pushy and did inform me installers spoke mostly Spanish. If I did not know room size though, I would have been ripped off. I had a similar problem with Empire as well. I got pulled in with their "buy 1 room get 2 rooms free" commercial so I figured it couldn't be over 5k for the whole house. First of all I knew what my sq ft was but didn't tell him. He had me pick the products...12x12 tile (they had nothing bigger) & cheaper carpet then gave me a quote based on his measurements of almost 1800 sq ft. I almost passed out. His quote WITH the free rooms came out to 13k after discounts!! Then he said "let me make a call to see if we can lower that". He came back and said they dropped it to 8.5k. Here I'm thinking "how can we go from 28k regular price to 13k with discounts and free rooms THEN drop it even more to 8k? Well I knew all I had was 1400 sq ft so I said I'd think about it...NOT! I called in my LOCAL tile company and they measured 14oo sq ft and quoted me UNDER 5k for mid grad carpet and 20x20 tile....sold! They did an awesome job. Empire is WAY too overpriced and they measure BIGGER then they need saying they need to make room for wastage. Wastage can't be 400 sq ft more and their products are the same as everyone elses.